National Game and Puzzle Week is celebrated from November 21st thru the 27th and National Puzzle Day is January 29th. It’s a time to discover all types of “Arithmetricks" in the classroom by playing games and puzzles in mathematics that stimulate analytical thinking and challenge kids’ problem-solving skills. Below are a few ideas to try. Give mathematics a creative touch by using your senses to experience “hands-on" number fun. 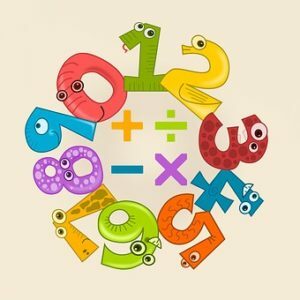 We are all familiar with giving a child a “feel for numbers" by allowing them to draw numerals inside a jellyroll pan with sand, cornmeal, or sugar. Another fun adventure is to give the child a piece of refrigerator cookie dough and instructing them to roll the dough into a long rope and shaping this into a number. After several students have made their numbers, bake the shapes and enjoy as a snack. My favorite classroom make and eat project is edible flash cards. 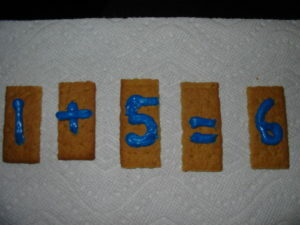 Each student will need three graham crackers (whole ones) and a tube of icing (this can be shared with the other kids). Instruct the children to break each cracker along the lines into four sections. With the icing, write numbers 1-10. You will also need a + and = symbols. Encourage the kids to create simple addition problems using their cracker cards. When the math session is finished, invite everyone to gobble up his or her flash cards as a snack. 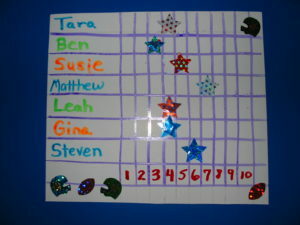 Kids love to play games and often do not realize they are learning skills when having fun. 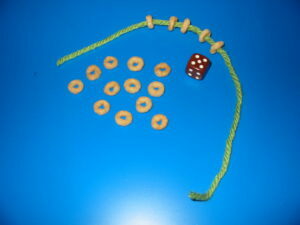 For this game place a bowl of O-shaped cereal in the center of the table with small groups of children. The object of this game is to roll a die and to be the first child to accumulate 10 pieces of cereal. Players take turns rolling the die and taking that many pieces of cereal from the bowl. When the player nears 10 pieces in his pile and on his next roll goes over the 10 in his pile, he must place all the O’s back in the bowl and begin again. If a student rolls the right numbers to collect exactly 10, he wins. Play this game until the kids get tired. At this point let them eat their cereal and on to some other fun! Another option for younger children is to roll the die and collect the O-shaped cereal until the bowl is empty. Then invite your students to thread the cereal onto a length of yarn to make cereal necklaces and eat the pieces at their leisure. Let your kids have fun creating and playing with homemade puzzles. Give everyone a half sheet of construction paper. Instruct them to draw four squiggly lines with a crayon/marker. Next, have the kids use a shape (circle, square, triangle, etc.) and draw a number of them on each puzzle piece. 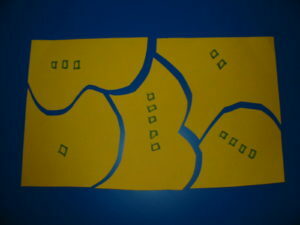 The pieces can be turned over and mark a different shape on this side to make an additional puzzle. When it’s time to play, each child can put their puzzle pieces together and add up the total number of shapes on each puzzle. Store all the pieces in zipper-lock bags. Another puzzle uses wooden craft sticks. Find a picture in a magazine (about half page will do). Spread glue on the opposite side and lay down craft sticks. When dry, carefully cut between each of the craft sticks. Mix up the sticks and invite the children to put each puzzle together again. Make a Bar Graph that plots the number of letters in a child’s name. Take a poster board and draw lines to make columns from 1-10 and a larger column to write the child’s name. Go around the class and plot (add an adhesive sticker) to the numeral that matches how many letters in the student’s first name. When finished pose some questions such as, who has the longest or shortest name? How many classmates have names with six letters or five, or three, etc? These are only a few of the many games and puzzles in mathematics that can be played during this special week in November. Here are other ideas from Bright Hub Education.